Click on the links or on the "services" tabs above to see how we can help meet your needs. Not sure where to start? Contact us or call: 267.342.4240 and we will send you a survey to help determine your key goals. From there, we will design an awesome seminar experience just for you! "The fresh perspective which Ken and Bertina bring to their treasure filled coaching seminars, remind us all of why we are coaches. The 'pearls of wisdom' they share spark conversation and creative direction for each individual to pursue." "They have direct contact with our clients." "Our staff is our most important 'commodity'." "Our business IS our staff." "It shows the staff that they are valued." "It keeps them interested and growing, therefore we retain them." "To empower them to reach their full potential." "So they love their job even more." "So they can be an even more profound, positive influence on our youth". "Their performance has a direct effect on revenue." "Student retention. It is easier to keep a student than it is to find a new one." "Management can invest time in development rather than 'putting out fires'." "So they can be more successful in other aspects of their lives." Sport Education and consulting, LLC is an organization, created under the laws of the state of Pennsylvania. Sport Education and Consulting, LLC strongly recommends that all individuals using this material use all prudence and concern for safety and injury prevention. 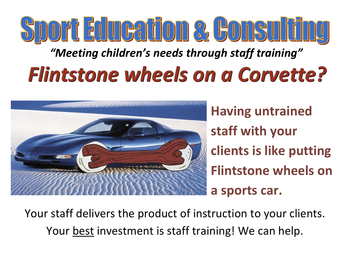 Sport Education and Consulting, LLC expressly advises that the use of these products does not in any way certify the user as a competent professional educator. These products are available to solely enhance your program when used responsibly and prudently. Furthermore, Sport Education and Consulting, LLC, its owners, operators, employees, and/or agents shall not be liable for any damages whatsoever arising from any personal injury or property loss sustained by anyone using these materials and/or information. All users of these materials and/or information provided by Sport Education and Consulting, LLC assume full and complete responsibility for all injuries and damages, which may occur, from the use and dissemination of this product. All users of these materials and/or information also hereby fully and forever release, discharge, indemnify and hold harmless Sport Education and Consulting, LLC, all of its owners, operators, employees, and/or agents from any and all claims, demands, damages or rights of action, present or future, resulting from any organization, person or persons using this information. Sport Education and Consulting, LLC exists to be a resource to those who work with youth. Our game ideas, event ideas, staff training presentations, and any content on this web site are provided solely as a general guide. Please use discretion, common sense, and all safety precautions as you decide what activities, programs, events and discussions you are going to do. You must understand the possibility of unforeseen hazards and know the inherent possibility of risk. The Sport Education and Consulting, LLC its leaders, employees, and volunteer staff are not responsible or liable for damages, losses, diseases, or injuries incurred by people using any of this information.